Well, she has been allegedly holding secret fundraisers for such groups. But let’s just say that Omar doesn’t know what she’s talking about. After all, again, Pelosi used this line to defend Omar after her series of anti-Semitic rants that were widely reported. The latest episode involved her accusing supporters of Israel for having dual loyalty, which is one of the oldest anti-Jewish tropes out there. She’s too dumb to know what she’s saying, so she’s not an anti-Semite. Yeah, that’s not going to fly. 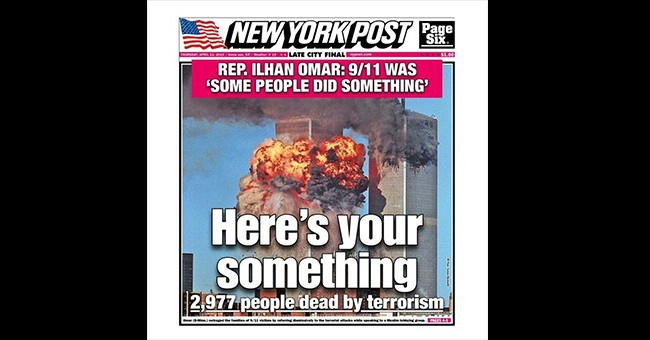 Also, just how Omar can’t claim ignorance for her alleged anti-Semitism—she’s lived here for nearly a quarter century and was educated here—she can’t play dumb about 9/11. In both cases, the ‘she’s too dumb to know what words mean’ only adds more the position that she should be booted from office.